Sometimes it takes a village, especially the first time. I catalog manuscript and other archival materials, the majority of which are unpublished and not described. They also cover a wide variety in type of material. Among the more exotic finds I have cataloged: a salesmen’s kit with patterns for men’s suits, musical instruments used by a jazz percussionist, feminist t-shirts, John Brown commemorative medals, and envelopes of 19-century bath and other powders. Last Spring we acquired the Lisa Unger Baskin collection, which features five centuries of women’s history. 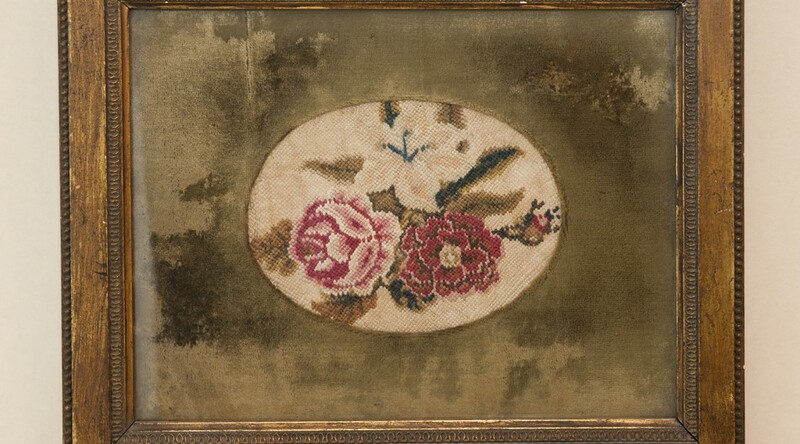 Among the items is a work of needlepoint, a flower study, completed by Charlotte Brontë around 1840. I had never cataloged a work of needlepoint. When faced with an unfamiliar format, a cataloger begins by looking for similar materials cataloged by colleagues nationally, searching in WorldCat. I found only a few pieces of embroidery, usually samplers, and those did not include extensive description of the item. I was determined to provide more detail than a basic record. 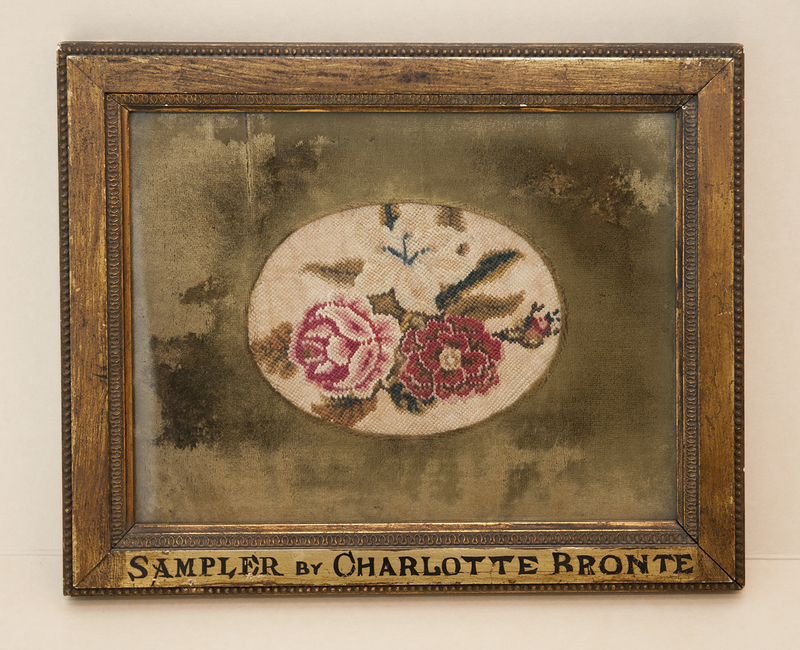 Fortunately, our donor had included with the Brontë needlepoint a photocopy from a book on Brontë artwork. The page focused on a flower study Charlotte had completed in watercolors while she was still in school. It offered a description of the piece which provided the level of detail I was seeking, so I based my own approach on it. 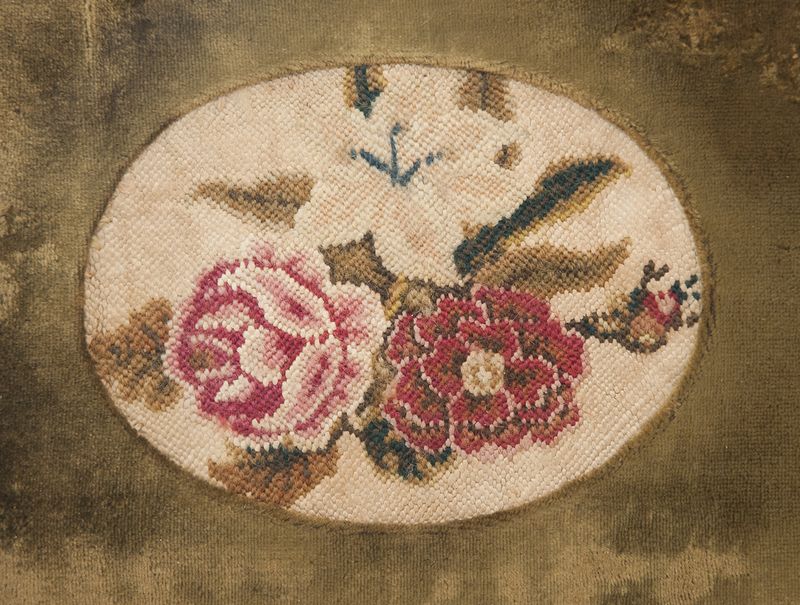 However, to move forward with this approach I needed to confirm what flowers were depicted in Charlotte’s needlepoint study. There was no argument that the top flower is a white lily. I felt the bottom left flower was a peony, while others said it was a rose. I had no clue what the bottom right flower might be. Who to consult? I approached a colleague who hails from England, and she offered to forward my photograph of the needlepoint to her father, who is a master gardener. After consulting his references, he agreed that the bottom left flower is a peony, and determined that the unknown flower on the bottom right is probably a carnation. I also had to consult with Beth Doyle, head of our Conservation Services Department, regarding whether Charlotte’s needlepoint should be removed from its frame. While answering this question (no) Beth let me know the thread Charlotte used was probably wool. Beth’s mother is a master needleworker who may be able to determine what type of stitch Charlotte used. Using all of this information, I wrote a description that provided the level of detail I was seeking, to give someone a basic mental image of the piece they would then find in our collection. However, even after I finished my initial work, one more consultation was required. My colleague, Lauren Reno, checked my catalogue record in RDA, the new cataloging standard I am applying to manuscript materials. She made several helpful enhancements. I am very grateful for the “village” of people I can call upon in support of my work. You can find the catalog record for the needlework here. Post contributed by Alice Poffinberger, Archivist/Original Cataloger in the Technical Services Dept.